Geromy G. Moore is a Research Microbiologist/Molecular Biologist in the Food and Feed Safety Research Unit at the Southern Regional Research Center for the United States Department of Agriculture-Agricultural Research Service (USDA-ARS) in New Orleans, Louisiana. He first developed a fascination with fungal biology while attending Stephen F. Austin State University in Nacogdoches, Texas as a Bachelor’s Degree candidate under the guidance of Dr. Josephine Taylor. He earned his doctoral degree in Plant Pathology from North Carolina State University (NCSU) under the guidance of Dr. Ignazio Carbone. Geromy’s doctoral research investigated global population dynamics for Aspergillus flavus, and he contributed to the discoveries of teleomorphic states for A. flavus and A. nomius, and also of inter-specific mating between A. flavus and A. parasiticus. 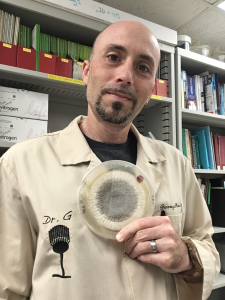 As a USDA-ARS, Geromy’s research is focused on understanding the field ecology and genomics for aflatoxigenic Aspergillus fungi, as well as understanding atoxigenic A. flavus strains used as pre-harvest biocontrol. He is particularly interested in elucidating mechanism(s) of aflatoxin mitigation at the cellular level, mating biology interactions, and persistence/stability of A. flavus in field populations. Geromy is a member of MSA and past recipient of the E.E. Butler Mentor Student Travel Award (2008). His past service to the organization includes acting as a session moderator (2008), graduate student mentor (2012) and student presentations judge (2015 and 2018). Geromy is currently serving on the MSA Environmental Health and Medical Mycology, and Diversity and Inclusion committees.